In my last post I showed you how to make a weighted hockey stick, now I will show you what you can do with it. 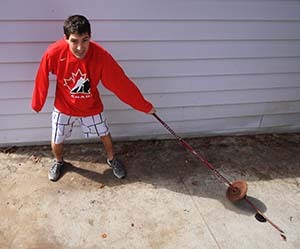 Stickhandling is a very important skill to master if you want to be a great hockey player. 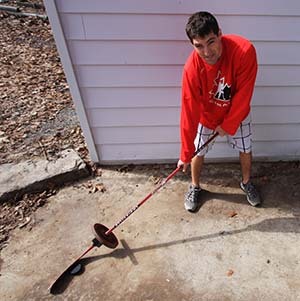 There are many ways that you can improve your stickhandling and in this article I will show you the benefits of using a weighted hockey stick, and how to make your own weighted stick. When you practice with a weighted hockey stick you will be working all of the muscles involved in stickhandling BEYOND the point they are typically worked when you normally stickhandle. This is great because you will be building sport specific muscles, and training them beyond the level that they would normally develop. Here is a great analogy, if you bench press 150 pounds every day, then your muscles will plateau and only be able to lift 150 pounds. If you continue to push your muscles and eventually bench 300 pounds, then when you go back and lift 150 pounds, it will feel VERY light. The same concept applies to stickhandling, if you only use a regular stick and puck, your muscles will learn the motions, but they will not be as quick as they could be. If you train with a weighted hockey stick for a while and then go back to using a regular stick you will be able to move the puck a lot faster. Another great benefit of using a weighted stick is the muscles you will build. When you practice your stickhandling with a weighted stick you will be building your wrists, forearms, bicep and triceps, pecs and core muscles. These muscles are involved in shooting and stickhandling and your core muscles will help with balance and stability, as well as shooting and stickhandling. You should practice moving the puck all around you, just like you normally would. I like to train in segments, this is my typical session with my weighted stick. I hope these tips have helped, but remember reading this information will not make you a better hockey player PRACTICE, PRACTICE, PRACTICE! Assuming I have good technique, will this also improve my shooting power? Or are there better drills for that?